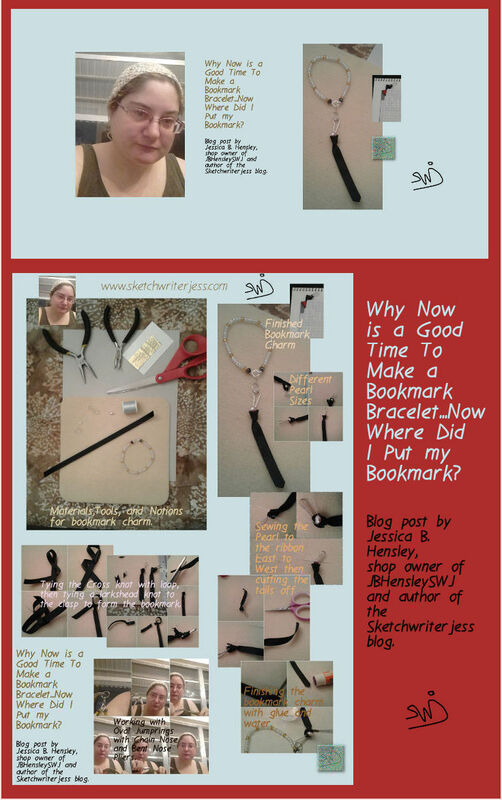 by Jessica B. Hensley author of the Sketchwriterjess Blog and owner of the JBHensleySWJ shop. If you already have a bracelet ready made with a ring to allow charms to hang from, then read on. : ). You’re about to read your favorite magazine and you want to use something to hold the place in the magazine after you read the article. Well you’ve got a bookmark sitting next to where your sitting but you don’t remember where you placed it, ah there it is....oopsie, dropped it. Now what? What is the best way to keep your bookmark ready for you to use at any time? 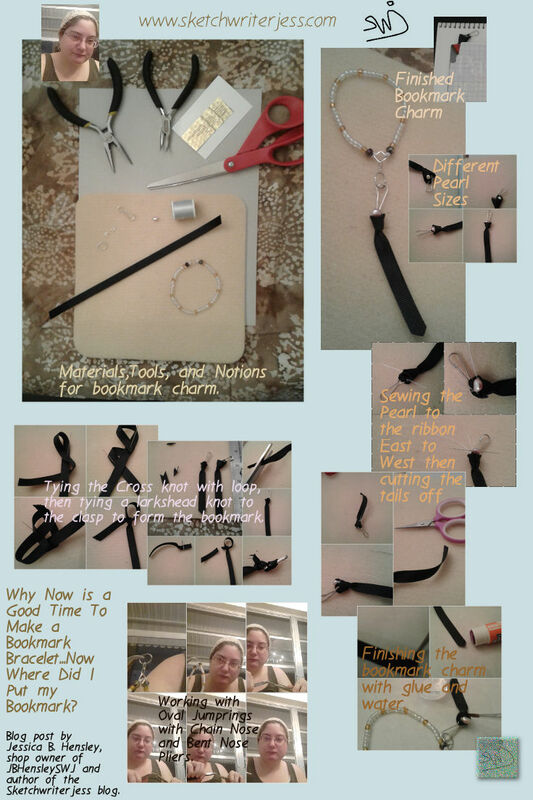 Make a bookmark that is also a bracelet charm! Then it’s on the bracelet any time you need it. Sound like what you go through every time you read a magazine or book? Lets get started with the materials needed to make the bookmark bracelet charm. Then read the steps and look at the pictures to see how it’s made. 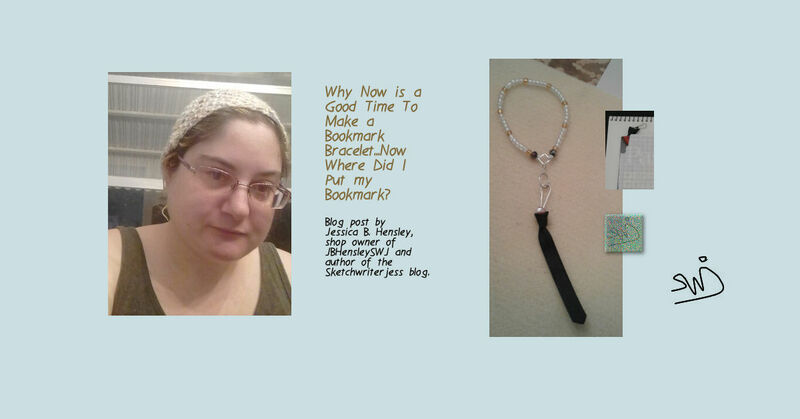 Here are 6 Numbered Sections with the steps Marked with Letters to making this Bookmark Bracelet Charm. 3. Sew on the pearl to the Bookmark charm. 5. Connect bracelet with jumprings. 6. Put the jumprings together. 7. Bookmark can now Be taken on and off from the last jumpring closed. A. Take ribbon from the left and cross it over the right side. B. Take ribbon just crossed and cross it back under the left ribbon side. C. Take the ribbon just crossed under, and fold it to make a loop towards the right ribbon side, bring it under the right ribbon keeping the loop intact. D. Bring the tail of the ribbon that has been crossed by the other ribbon up through the top loop, then down through the second loop. E. Push the knot closed until tight, while keeping a loop on top. Cut off the left ribbon tail. F. Pinch the bottom half of working ribbon edge to edge, East to West and cut at a diagonal as if cutting off a corner of a page. Leave 2.5" to 3" for bookmark use. G. Take the top loop of the ribbon, pinch it flat, then slide it through the clasp. For left-handed orientation, slide through with the opening of the clasp facing up. For right handed orientation, slide through with the closed part facing up. H. Bring the ribbon tail through the ribbon loop to form a Larkshead Knot. Push tight until the other cut off end is enclosed in the Knot Formed. I. Thread the needle so the thread is half it’s length, then tie a knot on the end of it. J. Sew pearl from East to West orientation, the holes go side to side. Go through the pearl twice around, then go through the pearl once more. Sew through the edge of where the pearl meets the ribbon. Tie a figure 8 knot, then an overhand knot to secure against the ribbon. K. Run glue over all cut edges and tails or the ribbon and the beading thread. Then brush glued areas with a paintbrush and water. Set aside to dry for 24 hours before using. L. Open the larger jumpring by holding the bent nose pliers in your non-dominant hand, right for left, left for right, and gripping the edge of the oval with the nose of the pliers. M. With your other hand holding the Chain Nose Pliers, grip other edge of the oval, near the opening. N. Pull the Chain Nose Pliers gripping the edge of the oval near the opening toward yourself. Do not pull it left or right, pull it straight to you. O. Repeat the process of lines L, M, and N with one small jumpring. The other small jump ring remains closed. P. Take the small open ring and click it into the square jumpring on the bracelet. Click it by picking it up with the Bent Nose pliers and moving the ring under the square jumpring so that the square jumpring edge can nest inside the small jumpring. Q. Pick up the other small jumpring with Chain Nose Pliers and click it onto the open ring, then close the open jumpring in the opposite direction as stated in the previous lines in section 5. Use the Chain Nose Pliers and push the open ring closed so that it meets the other end of the oval ring and it is completely closed. R. Take the large jumpring and repeat lines P and Q, but this time clicking the oval ring into the second small jumpring from the square charm jumpring and then closing the large jumpring. Phew! Time for a nap after this...: ). I use a glue stick and water because not only is it non-toxic, it breathes. It’s flexible. Jewelry cement is not. I like the idea of the ribbon retaining it’s texture and yet it will not fray. Any pearl, natural or faux can be used as long as the diameter is 5mm or less. Round pearls and button pearls in addition to Oblong Pearls can be used for this bookmark. However any pearl size more then 5mm will make the bookmark droop and fall out of the book or magazine. And one last thing about this method of making a bookmark charm, not only can you use this type of ribbon and pearl bead, you can use other flat materials and stones, which will be covered in future presentations on making bookmark charms. Share away! Yay Or Nay! If you enjoyed this presentation on how to make an elastic bracelet that won’t break, then please share. Click the share symbol either at the top of this post, or bottom of the post and a list of social media links will come up to share this post. If you are on Facebook, Please Like this post and the Sketchwriterjess Facebook Page. If you like and follow, you will get updates posted, not only from this blog, but from my other blog on Tumblr, swjreads. On that note, I will not be publishing the Tumblr blogs to this main blog any longer, I post it in other places that are more appropriate because the swjreads blog is more of an editoral blog, rather then an infomation hub for this art and craft business. You can see all the other platforms I use by clicking on the line box in the upper left corner, plus information about me. Thank you for reading. Consider this presentation practice. In December I will have an e-book with the techniques discussed in this presentation if you would like to continue your study. Come on back next Wednesday! you know you’d like too. I am notorious for taking years to read books and finish projects, well until this last year of 2017, however, there are a few projects I'm stubborn about finishing, fixing, and/or selling because I make excuses as to why I can't do those things. Here is an article to keep in mind if you feel like you are never going to get anywhere in your business or your life. Practice what is written in this article and feel comfort knowing others are doing the same. The Three part solution to finish projects you start and put aside, for days, months, or even years! I've learned quite a bit from both posts. I'm an experienced beader but I picked up good info. I have been known to have things fall apart. Not any more. Thank you Mom. I've done a lot of research of best combination of materials to use together to make jewelry so it doesn't fall apart. Its taken years of my jewelry falling apart at the most important times with family that made me realize I needed to step up my game to succeed in making jewelry last. Stay tuned to this blog to see more about jewelry making.